Unique round shape quality insulated cooler lends itself to special events marketing using soft sided coolers. Applications include sports related, schools, corporate gift, golf tournaments, technology, medical & more. 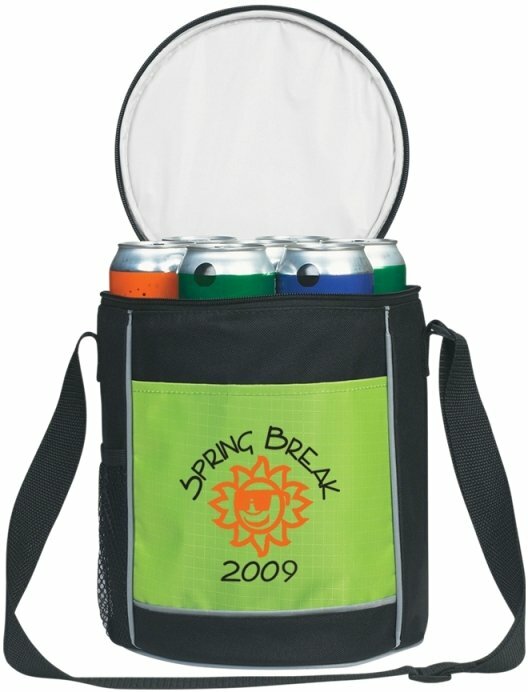 with large open front pocket, side mesh pocket, adjustable shoulder strap, 10 beverage can capacity. Overall size of the unique cooler is 8" diameter x 10" high. Delivery from date of an order is 3 weeks. Price includes a one color print on the front in an area 6" w x 3 1/2" h.